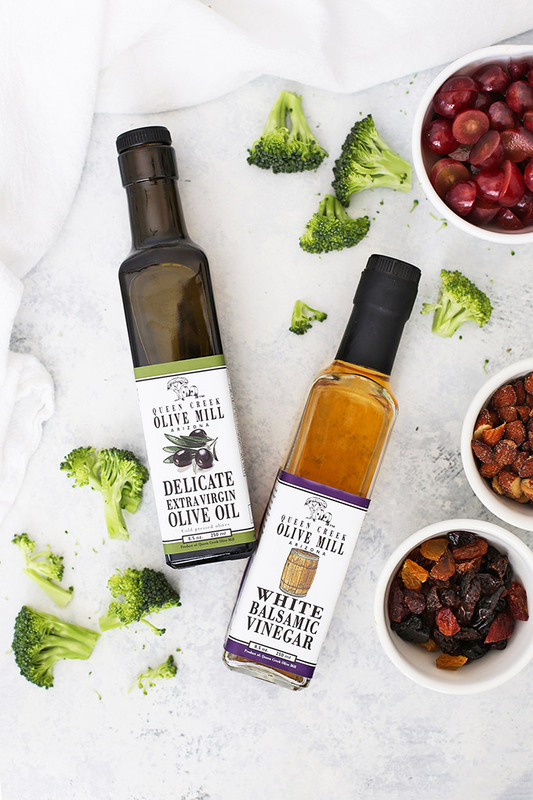 This post is written in partnership with Queen Creek Olive Mill–my favorite place to stock up on olive oil and vinegar! The weather is heating up and we’re already VERY much in cook out mode at our house! We’ve been grilling and favorite salads and lighter fare more lately and with all the summer get togethers around the corner, we’ve been brushing up on our grilling and picnic side dishes. 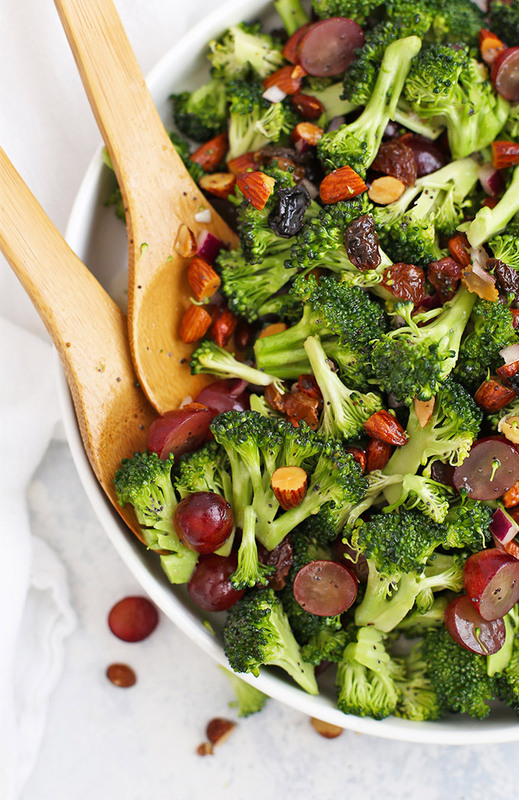 This vegan broccoli salad has it ALL. My bacon-loving, meat-eating husband declared this the best broccoli salad he’s ever had and begged be to make it again. And I have been! 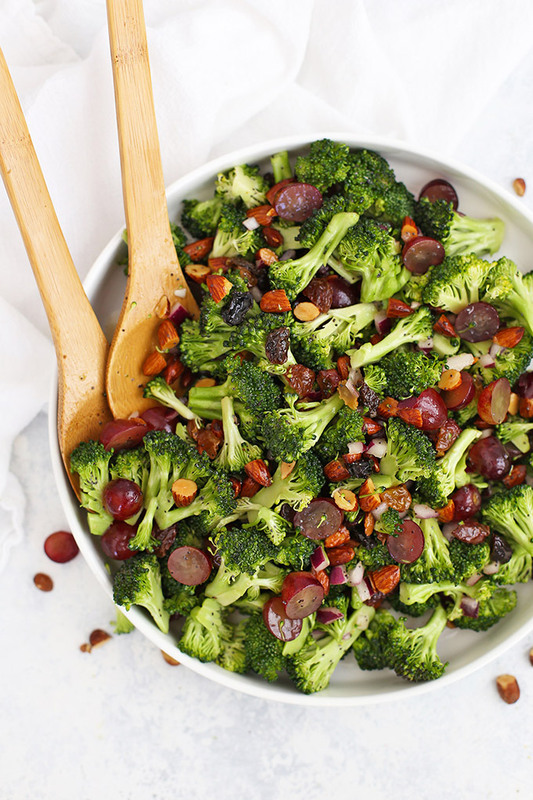 We’ve had this broccoli salad over and over again without any sign of slowing down. It’s perfect for summer parties, barbecues, picnics, and get-togethers. Plus, it works for gluten free, vegan, and paleo diets so it’s a great one to have on hand when feeding a crowd. I wanted to capture a lot of the same favorite flavors I love in the classic–smoky, sweet, tangy, salty, etc. But to keep things lighter, we swapped out the bacon and creamy mayo for smoked almonds (try them, they’re awesome) and a sweet-tangy poppy seed dressing that will keep you coming back for more. There’s no one element of this salad that I could name as my favorite–it’s so good all together! 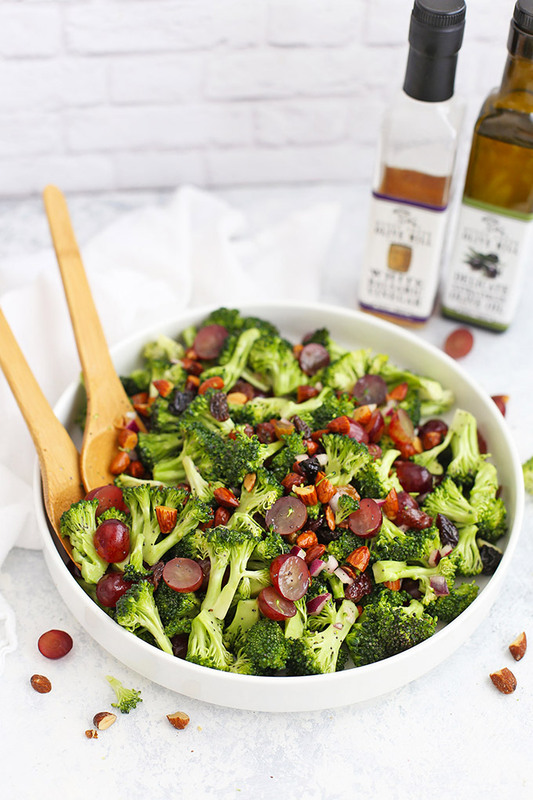 I love the sweet juiciness of the grapes, the smoky, salty crunch from the almonds, the sweet raisins, a little onion, and the perfect sweet and tangy poppy seed dressing to tie it all together. The end result is as delicious as it is pretty–look at all that color! The poppy seed dressing is light and fresh and hits all the right notes for me. I started with a base of mild olive oil–I used Queen Creek Olive Mill’s Delicate Olive Oil. It was light-tasting enough not to overpower the dish, but had just enough fruitiness and brightness to come through. Then, I used their White Balsamic Vinegar which adds the perfect tang and complexity. Swirled with a little pure maple syrup to balance the tang of the vinegar and finished with a sprinkle of salt, pepper, and poppy seeds, it’s the PERFECT dressing for this salad! Queen Creek Olive Mill is my favorite (FAVORITE) place to stock up on oils and vinegars. I’ve been to the pressing room and seen it in action firsthand, and have met some of the family who owns the mill. They take such pride in and care for the quality and flavor of their products. Their Balanced olive oil is my kitchen go-to for everyday cooking, but I can’t get enough of their flavored oils (the Meyer Lemon! The jalapeño! The fresh crush basil!) and vinegars. You could certainly experiment with this salad–try adding their traditional or flavored balsamic vinegars, or you could even add more smokiness by using their (VEGAN!) bacon olive oil. 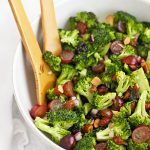 However you blend it up, this vegan broccoli salad is sure to be an INSTANT hit at your next family gathering! Almonds – I really love the smokey flavor of smoked almonds and *highly* recommend using them if you can find them. If you can’t or don’t want them, I recommend using toasted almonds. Play Around! – Don’t hesitate to play with the flavors or add-ins here! Try adding some shredded carrots, or diced apples into the salad. Or, swap out the oils and vinegars a bit. Add a dash of the (vegan!) bacon-flavored olive oil, or add a little kick with a bit of jalapeño olive oil! Or, swap in a fun seasonal vinegar, like their Peach White Balsamic (AMAZING) or a traditional red balsamic vinegar. 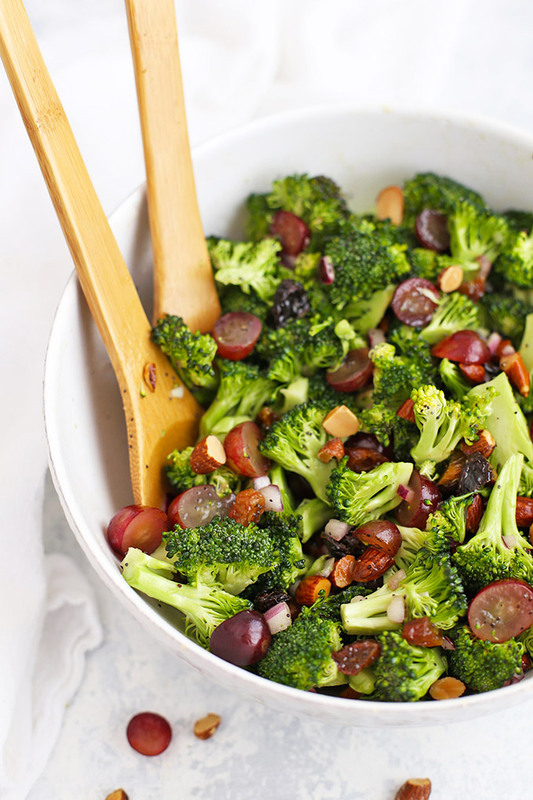 This Vegan Broccoli Salad will be a hit with EVERYONE at picnics and barbecues. It’s tangy, sweet, and totally delicious! Drizzle on enough dressing to coat. (You likely won’t need quite all of the dressing). Stir to combine. Add almonds right before serving! In a jar or liquid measuring cup, whisk together oil, vinegar, syrup, mustard, salt and pepper until well blended. Stir in poppy seeds. Store in the refrigerator up to 1 week. Make Ahead Tips – You can assemble the salad with dressing several hours (4-5 hours) before serving. The broccoli will soften slightly and absorb some of the dressing (I love it this way). Just save the almonds until right before serving so they maintain their crunch. Or, you can make the dressing a day or two ahead of time. « Lava Flow Popsicles – Paleo & Vegan! I haven’t had broccoli salad in years! I need to make this over the summer for sure! We’ve made it SIX times in the last few weeks because we keep devouring it! Ha! I hope you love it like we do!